What Forced President Obama to the Deficit Cutting Table? Last Wednesday, months after rejecting his own presidential commission’s recommendations for reducing the U.S.’s record deficits produced by his administration, President Barack Obama finally offered a plan to deal with the nation’s excessive federal budget deficit. He didn’t do it because he wanted to do it or because he genuinely believes it’s in the country’s best interest. He did it because he was forced to do it. To understand why that’s the case, let’s look at the situation with the U.S. national debt that was developing below the mainstream media’s radar during the last two weeks, part of which finally flew up into full view yesterday. (Reuters) – Standard & Poor’s on Monday downgraded its credit outlook for the United States, citing a “material risk” that policymakers may not reach agreement on a plan trim its large budget deficit. While the agency maintained the country’s top AAA credit rating, it said that authorities have not made clear how they will tackle long-term fiscal pressures. S&P said the move signals there’s at least a one-in-three chance that it could cut its long-term rating on the United States within two years. “Because the U.S. has, relative to its AAA peers, what we consider to be very large budget deficits and rising government indebtedness and the path to addressing these is not clear to us, we have revise dour outlook on the long-term rating to negative from stable,” S&P said in a release. If President Obama had not presented his sudden deficit-reduction proposal when he did, this new report would have read very differently. In addition to shifting to a negative outlook for the U.S. government’s fiscal situation, S&P might have finally pulled the trigger on lowering its credit rating for the United States, which would have the effect of increasing the government’s cost of borrowing money. That, in turn, would make it much more difficult for the government to continue spending the amount of money that President Obama really wants to spend. Instead, the world’s bond markets reacted positively to the President’s “johnny-come-lately” deficit reduction proposal, as it signaled that the President might finally be catching on to fiscal reality and that some kind of deal might be possible. The Simpson-Bowles plan shown in the first column is the product of President Obama’s blue-ribbon commission, which was released in December 2010. The second column shows the deficit reduction components of the Domenici-Rivlin plan, which came about as the result of a bipartisan effort that paralleled the President’s deficit reduction commission’s work, was also released in December 2010. 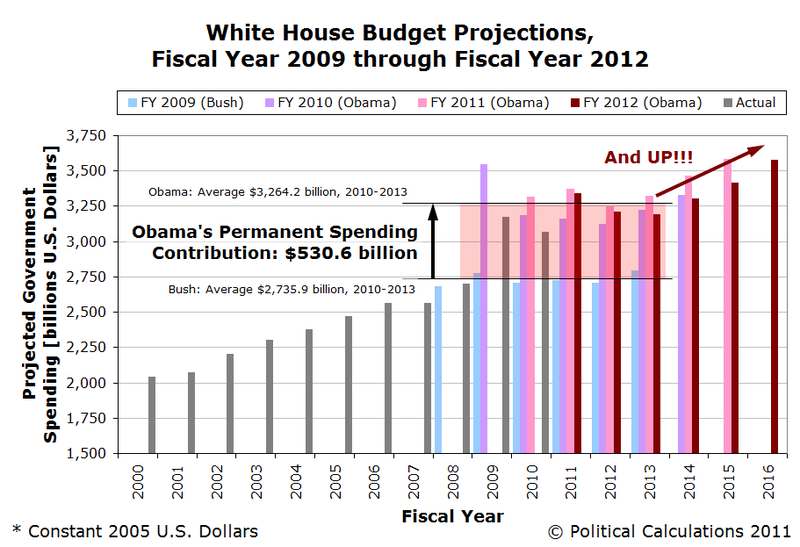 The middle column of the chart reflects the President’s priorities for deficit reduction as presented in his Fiscal Year 2012 Budget for the U.S. Government, which was released in February 2011. The fourth column represents the U.S. House of Representatives’ Ways and Means Committee chairman Paul Ryan’s “path to prosperity” plan, a budget resolution that was released in early April 2011 and has since passed in the U.S. House of Representatives. 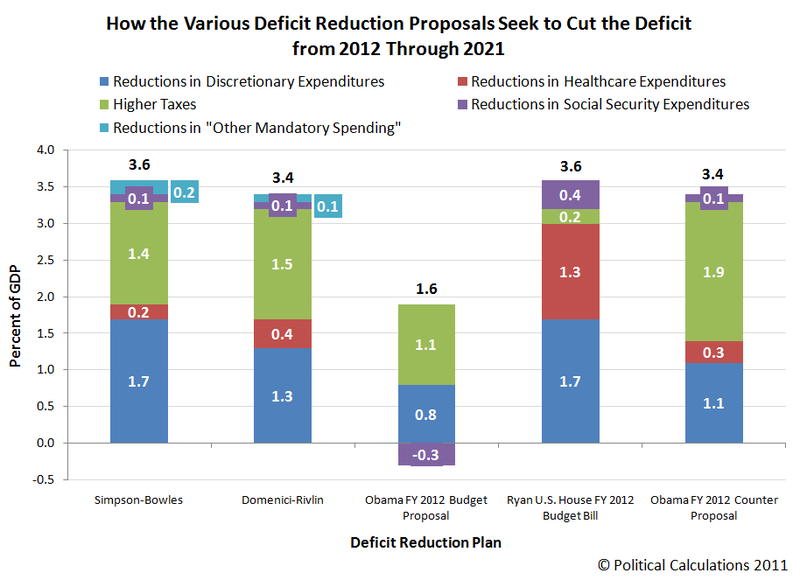 President Obama’s newly drawn-up deficit reduction proposal was released on 13 April 2011 and occupies the fifth column of the chart. And yes, the President’s FY2012 budget proposal actually proposes to borrow money to pay for paying out Social Security benefits, which counts against the higher taxes and reductions in discretionary expenditures (everything but Social Security, Medicare, Medicaid and Net Interest on the National Debt) he was also seeking. That’s not an error on the chart—that’s the equivalent of borrowing money for the purpose of meeting the payroll of a failing business! And that’s why the bond market signaled to the President’s Treasury department what was in the works behind the scenes. They appear to have finally gotten his attention. We’ll close by pointing to James Pethokoukis again, who offers the international perspective of the implications of S&P’s downgrade of the U.S. government’s debt outlook from stable to negative by Barclays Bank, and also reports the reaction to the downgrade by President Obama’s Treasury Department and by Paul Ryan. We’ll simply observe that Barack Obama can truly afford to learn something about the bond market from James Carville.